Valet parking prices are subject to change and may/may not include additional taxes. All prices indicate the daily rate. All prices include in-and-out privileges. For the most current/correct information, it’s always best to check directly with the hotel in question. Preferred Parking Facility for Oversize Vehicles with Additional Security for the Halloween & Attractions Show. Adjacent to the convention center on 7th St. Parking at individuals’ own risk. Not responsible for fire, theft, damage or loss. Overnight parking only allowed for oversize vehicles. If ​your vehicle does not fit in the C-9 garage due to height restrictions (6’6” max height), then it would fit the criteria of a​n oversize, non-passenger vehicle. Also, additional fencing will be installed to cover all non-fenced areas. Spaces will be guaranteed; however individual spaces will not be guaranteed. Packages will include in/out privileges from 7am-11pm daily; must re-enter the lot prior to 11pm for overnight parking. Daily parking (no overnight parking, no in/out privileges) will be sold on-site based on availability. Purchasers will receive a reservation confirmation via email. Please print reservation confirmation and provide to lot attendant upon initial entry. Preferred Parking Facility with Additional Security for the Halloween & Attractions Show. Adjacent to the convention center on 9th St. Parking at individuals’ own risk. Not responsible for fire, theft, damage or loss. Parking ​Instructions​: To park in the garage, you will pull a ticket from the automated machine at the entrance. Payment is completed on the exit at the automated machine. If you need assistance when there is no attendant on duty, press the call button on the automated machine and it will contact the parking call center for you. 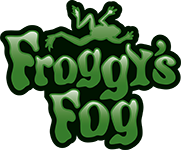 "Froggy's Fog will always exhibit at TW. Jen and the TW team are well organized and run top notch show. The booth traffic at the TWHS is almost overwhelming. This is the busiest show of the year annually. A++"